In keeping with the approach at ISH, towards education and the development of learners, many extra and complementary activities and partnerships take place between the school and local as well as international organisations. Through such initiatives ISH continually supports the ‘learning’ which is at the heart of the school. Listed, and described below, are some of these opportunities. Model United Nations (MUN) is what the name proclaims: a simulation of the real United Nations (UN). As delegates, students step into the shoes of ambassadors from UN member states to debate current issues on the organisation's vast agenda. In their role as UN representatives they gain an insight into the workings of the United Nations, develop research, public speaking and diplomacy skills and have the unique opportunity to learn about the politics of the nation they represent. As well as gaining an understanding of the function of the UN, one of the world’s most vital international bodies, the general knowledge attained by these students will help them better understand how they can contribute as individuals to make the world a better place. For ISH students, MUN activities also include the opportunity to attend other conferences including The Hague International Model United Nations (THIMUN), the world's largest MUN conference for secondary school students. They also coordinate and lead MUNISH, our school's annual conference held annually on the first weekend of November. 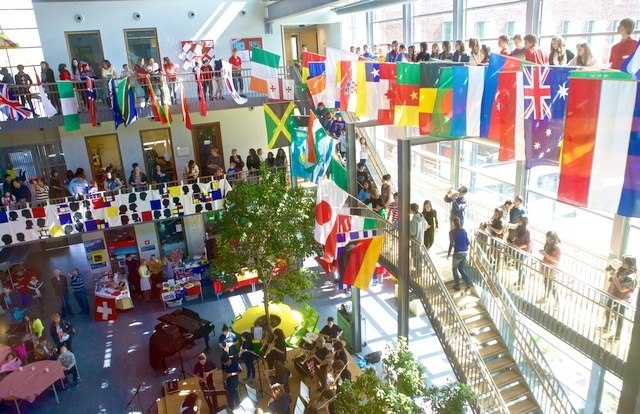 This event, an annual three day simulation of the actual United Nations, is attended by students from around the world and has been a part of the school for the past 26 years. It is also organised and run by students here at ISH. With over 1000 participants last year, of over 60 different nationalities, from schools situated in more than 10 countries, the conference creates a truly international atmosphere. During the conference, students discuss and try to find solutions for some of the most important and challenging international issues of our time. Although some MUN activities are offered only to senior school students (Years 10-13), the MUNISH conference offers older Middle Years students opportunities for participation in the areas of administration, communication and catering, in addition to delegate roles. Click here to visit the official MUNISH website, created by students. The annual INTERNATIONAL FESTIVAL always takes place in spring. On this day our school community celebrates its cultural and culinary diversity through food and drink stalls, a book sale, a flag parade and country related performances and music. This festival is arranged by the ISH community for the ISH community involving as many different parties as possible. The Parents association plays an instrumental role in the organisation of this vibrant event. Everyone is welcome to help create and enjoy a truly International Festival. Pre-University College Leiden is the Honours College for talented senior secondary school students set up and run by Leiden University. ISH has been involved as a founding member of the College from its beginnings. Pre-University College Leiden offers a two-year program of 40 afternoons of lectures, tutorials and workshops at the Honours Academy campus of Leiden University. Topics cover the full range of the academic disciplines the University offers. Graduating students receive official academic credits (ETCs) and a Certificate which can help students in applications to some of the more prestigious higher education institutes. Eco-Schools Holland is the Dutch branch of the international organisation (with roots in the UK) that provides schools with an accreditation protocol and certification that recognise measures schools take to promote sustainability, in the curriculum as well as in extra-curricular activities, organisation and in building management. Eco-Schools have rewarded ISH with its highest accolade, the Green Flag. Jet-Net is a Dutch organisation founded with the aim to promote the importance of Natural Sciences in the curriculum, and to enhance the profile of the various Higher Education Degree Courses in technology and sciences on offer to graduating students. It partners schools with technological institutes and corporations; facilitates guest lectures from, and school visits to, these partners and organises Careers Fairs on Science & Technology. ISH has been a member since 2004. Worldschool has several programmes. One involves secondary schools in projects that support small NGOs working in developing countries. Another offers study programs at Dutch ministries, universities and other relevant institutes that deepen students’ knowledge on issues of sustainability and national identity in a European Union (EU) context. ISH students have been regular participants in the EU programmes, and have visited Delft University of Technology, Wageningen University, Ministries of Infrastructure & Environment as well as Foreign Affairs, Clingendael Institute and the EU Parliament in Brussels for their research and reports. The Shell Eco-Marathon Europe is held each May in different venues around the world. Eco-Marathon participants, mostly universities and technical colleges from Europe and abroad, build full-sized, motorised vehicles that are ‘raced’ in the marathon with the aim of gaining maximum fuel efficiency. Fuel categories include gasoline, hydrogen, and electricity. ISH, as one of the very few non-tech secondary school participants. We are the Silverbacks Engineering team - a team of 20 members from ISH. We are dedicated and knowledgeable students, promoting sustainable energy. Our goal is to educate, innovate and create. With the help from sponsors, we design, build, test and drive an energy efficient car. Silverbacks Engineering challenges us as a team and teaches us to work together, to develop as students and global citizens. Previously we have passed all safety inspections, we are very motivated to bring our knowledge to the event again, and hope to be successful. Held first in 2012, and for the second time in January 2014, the International Moot Court programme offers secondary school students from The Hague an opportunity to be coached and prepared for a week long’s competition with 16 school teams from all over the world. A (fictional) International Criminal Court case, presided over by professionals from the field of international law, sees students take up the roles of prosecution and defence to argue and plead the case. The finals, between the best prosecutor and defence teams are held in the Peace Palace. ISH has been involved in the organisation of the event; has hosted The Hague teams coaching sessions and has had students participate in The Hague teams. Fonds1818 has been a regular contributor to various ISH initiatives, activities and events, including the construction of GreenSpace, the award for ISH as the first Groene Schoolplein school in The Hague; our Challenger program, and the TEDx events.